Okay, so we’re in the 70s, late 70s to be less general. We’ve got a kid called Joe Lamb: his mother was just killed in some unknown horrific accident. He’s at a funeral held in her honor. Just to kick off the poistivity, this opening scene is awesome. It feels very real and not like some staged instance that is just there to be there, very alive and creating an atmosphere that feels rich with stories, the stories of each character we meet in this sequence that is (some more notable than others). We cut to four months later and Joe is working on filming a zombie flick with his friends, the director being his buddy Charles, a chunky funnyman who seems to be very concerned with their film’s “production value.” During the shooting for this film, a train rushes right by the set and gets into a terrible accident, nearly killing the cast and crew. They discover that some sort of living cargo has escaped from the train, and is now loose on the streets of the hometown of our heroes. Over the course of several days people go missing, the military arrives (of course), the citizens’ dogs run off, and nobody knows what is causing all this. What could this monsterous creature be? Is it one at all? Well, go see the friggin’ movie! It’s AWESOME! I don’t even want to say a whole lot just so you can experience what I experienced (and I need to go to an acting gig in a bit). This movie, in my opinion, is truly an instant classic. It’s hard to find fault with it. The dialogue is hysterical at times, and then also chilling during some moments, but never swings too far one way or too far the other. J.J. Abrams was very good at the when directing Star Trek as well, keeping a balance in atmosphere throughout the film. He really is a master level director already. I was also shocked with how good the effects were in this movie. I won’t tell you what the thing is that escaped from the train, but it looks badass, for real. And the train crash scene is epic, looking not only very real, but also spontaneous and thrilling all at once. The cast in this film is phenomenal, especially considering the main star, Joel Courtney, is doing filmwork for the first time, as in he’s never been in a movie before. I tell ya, the stuff he does here is so real. Instead of being the indicated crap you see on T.V. these days, he brings to the table an actual human being experiencing what’s happening in the film. And Kyle Chandler as Deputy Lamb was absolutely awesome. You got how torn he was about doing the right thing, and you got how brave he was when he actually did it (or how wrong he felt when he didn’t). The other kids did a great job as well, once again, as I said about Joel, being very real and entertaing all the way through (especiall Ryan Lee. God is that kid a scream). 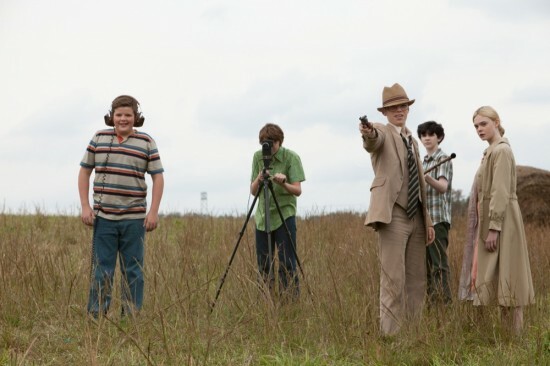 So go see Super 8, now! It’s honestly the best movie you’ll see this year. It may be the best movie you’ve seen in the past five years, truly. I know I’ll be using it as an example for years to come of an excellent film.